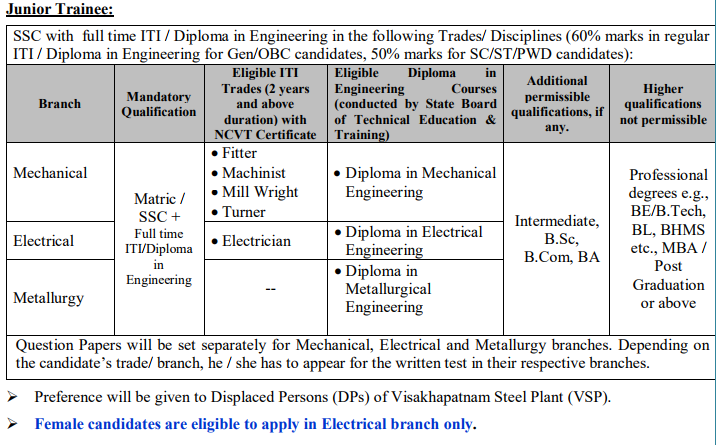 Rashtriya Ispat Nigam Limited - Visakhapatnam Steel Plant (RINL-VSP), a Navratna Company under the Ministry of Steel, Government of India and India’s first shore-based integrated Steel Plant , invites applications from qualified, young and competent Indian Nationals for the Posts of Junior Trainee & Field Assistant Trainee. Rectt. Advt. No. 03 /2017. Visakhapatnam Steel Plant is known for its Quality Products and Customer Delight. A market leader in long Steel products, it caters to the requirements of the Construction, Manufacturing Automobile, General Engineering and Fabrication sectors. It has been supplying various grades of steel for construction of projects of National importance which include Metros,Power Sector, Bridges, Nuclear complexes and several others. RINL-VSP has exported finished products to many countries. RINL-VSP is the first integrated Steel Plant to be certified for ISO 9001:2008, ISO 14001:2004 and OHSAS 18001:2007 standards. It is also the first PSE to be certified for ISO 50001 - Energy Management Systems and CMMI Level 3 Certification for Software Development. RINL-VSP is also certified for ISO 27001 - Information Security Management Systems (ISMS) in Information Technology - Enterprise Resource Planning (ERP) services in VSP. Selection will be through Written Test and Certificate Verification . Apply Online at RINL-VSP’s website http://www.vizagsteel.com before 21st June 2017 . For Further Details visit the website and go through the Official Notification Rectt. Advt. No. 03 /2017 before applying for the post. Registered Office Address : Rashtriya Ispat Nigam Ltd. (CIN: U27109AP1982GOI003404) , Administrative Building, Visakhapatnam Steel Plant, Visakhapatnam - 530031, Andhra Pradesh, India.